It's been almost two years since we first met, so our first shooting is a great celebration of our friendship and work! I never met a person like her. Common misconception in this world is that you can't really have a true friend, because everyone is your competition. I guess they were wrong. I found one! We clicked since day one. She was nothing but supportive the whole time. There wasn't a moment where you could feel bad vibes or envy. She actually taught me to be more optimistic. We grew so much together! We pushed each other to do more, to be better version of ourselves and we made it and we are going to be even better. Just take a look at our pictures from one year ago. Take a look at our blogs, our style, it evolved a lot and it'll keep on evolving. It's really nice when you have someone by your side, especially in this cruel industry. I'm so grateful I found a true friend, with whom I can talk about everything and anything. With whom I can be without internet, just sitting and chilling on the floor without wifi and to know I got her by my side. That's true friendship! It was awesome when we got a chance to represent pieces from new H&M Trend Collection. The moment when we decided to shoot together was even better. It was amazing! At the first glance, we thought we wouldn't make it because our outfits were very different, but we managed it. I love how our outfits are highly contrasted, as well as our personalities and styles. Mine is more on the girly and feminine side, and Jelena’s is on cool and urban one. The most interesting part is that both styles go perfectly together! So, what is your favorite piece from H&M Trend collection? Don't forget to check Jelena's post! Since you asked, I like the pink outfit a lot, including the (faux, hopefully) snakeskin shoes that give it a little wild touch. Beautiful photos, and beautiful ladies. What a wonderful true friendship. And I really love the outfit though..both the pink dress and the black and white combination are really a killer. I am more a black and white person. That's my style..can't believe its from H&M, I am going to check that out in our outlet here. Wow very appealing. Love these selections. You girls are dolls! I love both of the outfits! They are both so stylish but you are right totally different pieces! Love it all. Great pictures. Such pretty looks on both of you! You guys look so elegant and chic. These pictures are absolutely stunning!! Loving both of your looks! That pink dress is gorgeous! You are so very lucky to have found each other, friendships like that only come once in a lifetime, if at all! I love the outfits, especially the pink dress! I love this friendship post - this is something very special! Also, the outfits you are both wearing are fabulous and I need to make a visit to H&M! It's a horrible misconception that we would be each other's competitors, but the story about you two strengthen my belief in the fact that we are here to support each other and push each other to grow, both on social media, but as persons as well. I'm so glad you've found that friendship! As for the H&M collaboration, it's a beautiful combination of two completely different styles and the old saying "opposites attract" really makes sense here! I love each of these outfits, would really struggle to pick out a favourite! The pink dress is so elegant with a 50's feel, and the other is so chic and classy. Such a beautiful friendship!! Love every shot and love those outfits!! i love your dress, it is so pretty and feminine! and love that you did this shoot together! I love both of the looks actually! I could see myself wearing that dress to a wedding or a nice date night, and the black and white likewise or even the workplace. The possibilities are endless for both! You girls look so stunning in these outfits. I adore both looks and the colors. So beautiful that you have grown together as friends and share this with us. Gorgeous pictures, too! I need her the pants and the dress ASAP!! Society paints women as competitors. However, not all women fall victim to society's standards. I'm so glad you ladies didn't! Seems like you two are a good friendship example! I love both of your looks! I could see myself wearing either outfits. One for a more feminine and romantic look and one for a more chic and classic vibe. So cute to see bloggers who support each other and grow together. Love you both. That lace dress is everything! Gorgeous post! yes true friendship exist in every industry, it is just very hard to find. I am like you, I prefer more romantic outfits, but Jelena's outfit is great too! Gorgeous dress! Love your style! It's so wonderful to see strong women supporting each other rather than competing! You are both amazing and this was such an enjoyable read! I love both the pink look and the black and white ! So gorgeous! Such a great story! And I absolutely love the clothing! Those pants and that dress.....HEAVEN!! I'm not sure if we have the H&M Trend collection here in the US, but both of your outfits are stunning! I love girly pink lace dresses, but also sleek monochromatic looks too. I would wear both outfits for sure! Omg, I can't believe that this dress is from H&M, i don't remember when last time shopped there. Your friend styled pieces amazingly too! Love all photos! This is so inspiring! I love that you two have such a beautiful friendship. There is nothing better than women supporting one another. The H&M pieces are also incredible!! Wow. Will definitely buy some for myself. Very beautiful. It is so wonderful to have a fellow blogging friend like this. I am so grateful for the friends I have like this, turing to them to vent frustrations about instagram, or ask questions about how they feel about a brand proposal or heck even which top to pick out, helps so much. You both look lovely in this shoot, both outfits are super cute on you both! I can not pick a favourite, you both seem different. You both look so vibrant! I love the pink lace dress on you with the python shoes! Where would be without our besties! Beautiful outfits! Love it head to toe. You two look so pretty and feminine, both outfits are totally chic and sophisticated. Amazing post, you have a beautiful friendship, I'm always thankful for my friends. So I would love to have a shooting with my best friend! That's so cool to have close blogger friends :) Both of you styled the H&M pieces so beautifully! Gotta love your dress though! Great pictures, happines and spread love.Beutiful outfit of both girls. You girls look fabulous, I love H&M. Their prices are always amazing. I love the off the shoulder lace dress! Both of you look super chic! It's always great to have great friends in the blogging business because it can get so nasty sometimes. It definitely helps to have that extra encouragement! That's a great way to celebrate your friendship with such a beautiful photoshoot to capture the memories. I love both your outfits and would definitely wear such pieces! this is sooo cute! love all of these beautiful photos! So glad hearing your friendship is so real and that you could learn so much from each other! As for your outfits, they were fab! Loved the dress you wore, it has such a pretty color and the length is so on point! Have a great week! How fun to shoot with a friend. I love both looks. I am obsessed with ruffles and lace, so the two are both ones I'd wear. So fab! Such a beautiful post girl! You two are stunning and love bot of your styles! That's a great story you two have there.. True friends are really hard to find these days. This is my first time hearing about this H&M collection and I must say I love everything you guys are wearing!! That dress is to die for and sooooo perfect for Spring! What a beautiful and sweet post! I'm a firm believe that as long as you are the best version of yourself there's no such thing as competition and that leaves so much more room in our heads and hearts to create meaningful relationships like you two have! As for your outfits, let me say that I adore that you shot together! I'm you on one day and her on a different day. It's really refreshing to see a post like this where I could get two different styles that I connect with in one post! Just lovely! These pictures are amazing and you both look great and stylish. I really like the pink lace dress. Theres something about lace, you just can't go wrong with it. This is so inspiring, I love reading stories like this. Girls should support each other not compete each other. I love both outfits and that pink lace dress looks gorgeous on you. I been looking for a similar dress but was looking for a white version. Maybe this green version would work for me I don't think I could pull off the pink as you do. Beautiful both of you ! To have a friends who is loving and supportive is a great thing! I am soo happy to have people like this in my life! I am happy to hear that you have found one and that you have both grown together, as well as have the same interests. Your photos are gorge! Wow ladies. What a wonderful relationship. I'd love to have a blogger bestie that I could spend just about every day with. My blogger bestie is all the way in Miami and I'm in the midwest. So happy to hear your friendship story and love all the positive vibes. You two also look so lovely in these photos. I love hearing the story of your friendship! I too have made a few great friends through blogging. You both look absolutely gorgeous in these looks! That pink dress is seriously the prettiest thing ever!! I can't believe its from H&M?!! For being H&M I do feel like it was a bit pricey. But still absolutely gorgeous!! This is such an adorable post!! You both girls look absolutely stunning and love the idea of supporting each other. Thats a real friendship and I'm glad you both have each other. LOVE the pics and the looks of each one of you. Thanks for sharing your friendship story. That's so cool that you guys found support and a beautiful friendship from each other. Did you meet through blogging or you started blogging after you had become friends? I think this editorial shoot totally works even though both of your outfits are different and in high contrast of each other. That's actually what I love about the 2 styles. Moreover you both styled your outfits flawlessly! You both are looking so stunning, I love both of your outfits. I totally agree with forming friendships with other bloggers, rather than being competitive. And collaborative photoshoots are the most fun. I think we all have our individual style, but when we collaborate together, we are always inspired by one another. I love that both of your outfits are so different, but they look so perfect together in the pictures. I really love your pink lace dress and handbag, such a chic look thats styled so perfectly :). You girls both look so fab!! 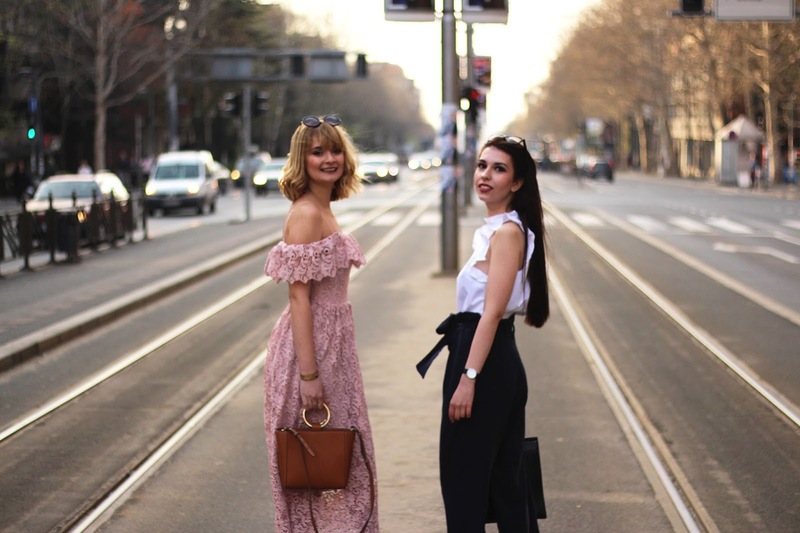 I'm so jealous of you having a blogger bestie! Love that pink lace dress and I've had my eye on that cute Mango bag! It looks sooo good on you! That's so wonderful to find a friend that truly supports you. I love H&M they always have great on trend pieces at good prices. It's amazing and so cool that you got to do this shoot congrats!! I loved both of your looks esp your bag! And her gorgeous pink dress perfect for date night. I love your pink dress! I can't believe thats from H&M. is it available now in Canada? I'd love to purchase it. Also I loved that you did this shoot with a friend. I know what you mean about finding a true friendship without jealousy, envy or comparing each other. It's hard to find a great friend from the same of your industry mostly for blogging. Loving both of the outfits so so much, both are feminine and trendy.